Silly little neko mimi girl in love with Yoshi say's HI!!!!! Hi everyone. I joined this site a little while back and have been waiting quietly in the shadows just watching (you didn't see me did you? 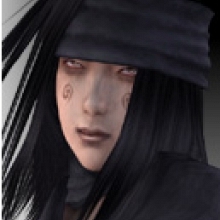 I'd make a great ninja huh?). Anyway, having joined in a few chats in a similar way to how I just start chatting to people randomly in pubs (I'm British), I thought I should introduce myself. I'm a female in my 20's (though I look about 17 and I'm tiny). I'm a bit strange but only in a happy, hyper sort of way. I'm sane really, honest! Until recently I didn't really like fighting games, especially not playing them. Yet being a lovelly, sweet, kind (and modest?) girl, I always bought my boyfriend games when I got paid (it kept him quiet). Then, one fateful day I bought Tekken 5, took it to my boyfriend's house and sat back to watch him play (another oddity, I actually enjoy watching people play video games more than I enjoy playing them). 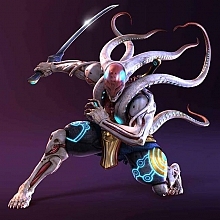 Then I saw this amazing guy on the sceen (Yoshimitsu, obviously). You know when you see someone across the room and your eyes meet and you're just like 'wow, where have you been all my life? ', well it was nothing like that but still, I knew I was in love. So, I did my research into Yoshimitsu, watched him for hours a day on youtube, wrote a massive story about him (it's a thing I do) and all but proposed to him. But there was one problem, I was too scared of playing video games to actually have a go with Yoshi. I eventually snapped and HAD to have a go and so I got my posterior given to me on a plate (I'm talking, perfected in almost EVERY round, here -the shame, the shame!). But being the determined little thing I am, I sneaked onto the game whenever my boyfriend was out and quietly got better. Now when I play him I have at least half a chance but I'm determined to get better. Unfortunately I don't actually have a playstation 2 on which to play the game but guess what?? No Guess! .... Oh okay I'll tell you, I'm getting a bonus from work next month and its EXACTLY the amount I need for a PlayStation 3! Now all I have to do is wait for the release date of Tekken 6! Welcome aboard. Sit back and enjoy your stay. and at least aa liiitle crazy ^^"
Thanks everyone! Who knows what it is that makes Yoshi-kun so amazing and so appealing. It's one of those mysteries of the universe, like 'Who made the pyramids?' 'Why did T.rex have such pointlessly useless arms?' 'And who was the first person to look at a cow and think 'I wonder what happens if you tug on those hangy down things?' I guess some guys have it, some guys don't. I think I'll be at home here. My little picture-sort-of-thingy doesn't work (translation; I'm dumb around technology). Was going to make mine a pic of me in my best harajuku girl clothes wearing a fabulous pair of neko-mimi and everyone would have been like 'wow, she's wearing clothes from harajuku and a pair of neko-mimi.' and everyone else would be like 'Oh yeah, so she is!' Never mind. If only everything was a simple as myspace <sighs and looks dreamily out of the window for a moment> Ah well, such is life. Eh.. I'm a little late saying hi. But A lot happened here when I wasn't looking ^^"
Anyway, welcome to YOT Jembru. It's great to have you here and you're very talkative. :) I was pretty much introduced to Yoshi in a similar way as you but through a friend; he insisted that I should play Tekken against him. So I did. And on the character select screen I found Yoshi to be a most ((Unique)) character of all, so I decided to play him. Despite the fact his looks and wins scared me, I found him very interesting. Especially when my friend couldn't decided what Yoshi was supposed to be. Alien, robot... Cyberman?! My gosh! I didn't know what to think, but I became increasingly more interested in him when I search him on the internet. Me?? Talkative?? Surely not!! lol. Thanks for the welcome Sumsamurai. Yeah, newbs unite!! Thanks pinrin. Hope you have a great one where ever and how ever you celebrate! Love you all!! A bit late, but welcome. Yes... I'd say, slightly late but the best things are worth waiting for!! ^x^ Thanks for the welcome anyway Tora! Hope you had a nice Christmas!! !